Conway’s Law and Technical Debt – Keeping it simple…? Everyone wants to be agile. It is the catch cry of the day, along with cloud computing, big data and payments processing. Agile software development boils down to do more with less, and communicate more with less. Do more with less is about using fewer but better suited tools to improve productivity. Communicate more with less is about increasing the design discussion and feedback loops without the overhead of maintaining large documents – note the difference between “discussion” and “documenting what we built”, something many projects confuse. But I’d postulate that all software development methodologies still fundamentally view software development as a single team activity; despite our typical work environment consisting of multiple teams; multiple delivery structures. Yes, every project manager has the list of external dependencies on other teams and other systems, but it is just a milestone tracking list. It doesn’t help us become more agile. Similarly, the Scaled Agile Framework is more about making the project management office or the enterprise release management teams more agile than addressing the multiple team challenge. The below diagram illustrates three projects tasks to deliver three solutions. The three teams must leverage existing corporate assets (e.g., an inventory system or general ledger system) to avoid causing trouble, but the trade-off is overlaps between the three solution spaces. Secondly, the trade-off agreement between team “A” and team “B” will in all likelihood impact the possible trade-off agreement between team “B” and team “C”. Conway discussed this problem back in 1968 and framed it as the correlation between organisational structures and software structures. Bass and others have found similar evidence of projects getting into trouble due to “architectural misalignment”; that is the difference between the organisational enabled communication structure versus the communication structure needed to solve complex architectural problems. This “structures correlation” problem is commonly referred to as Conway’s Law, although “structure” does need to be understood more in context of Bass’ design problem discussion than Conway’s original and more literal computer code structure context. Your company’s methodology calls for identification of project interdependencies; dutifully noted as part of the initial planning efforts. Early design work uncovers overlaps with other projects (hopefully on your list). But we are all polite and work together, as schedules haven’t yet been tightened (too much); aka we send a few emails with draft designs attached. And why does all of this matter; other than stop annoying colleagues? 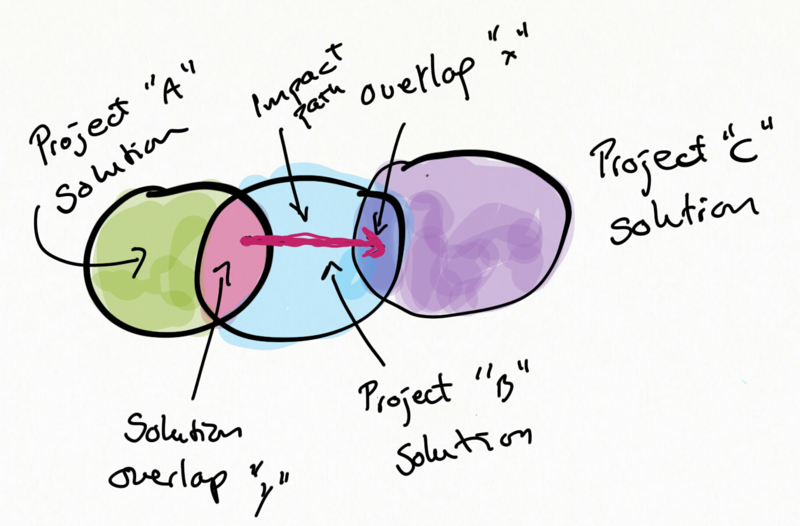 Teams disconnected by organisation, location and/or time cannot make appropriate trade-offs and the scene is ripe for piling on the technical debt.